“Lazarus is dead,” Jesus tells the disciples. It’s not hard to imagine the questions that might be running through the minds of the disciples and the hearts of Mary and Martha. They are the same kind of questions I have heard being asked and I have asked myself over the last several weeks as this parish and our surrounding community endured tragic accidents, deaths, and funerals that came way too soon. They are the same kind of questions we ask ourselves and each other whenever life is interrupted and changed in ways we do not want. They are the same kind of questions we ask when circumstances show us just how difficult, fragile, and beautiful life really is. Why? How could this happen? What’s next for me? Is this an ending or a beginning? Could it be both? How do I move forward? How do I make sense of what has happened? What will life be like now? Why didn’t it work out the way I wanted? What could or should I have done differently? Is there life after this? Why didn’t God do something? Every one of you could add to this list. We all have our questions, thousands of them. The ultimate question, the one that lies behind and grounds all our other questions, is the one God asks Ezekiel. 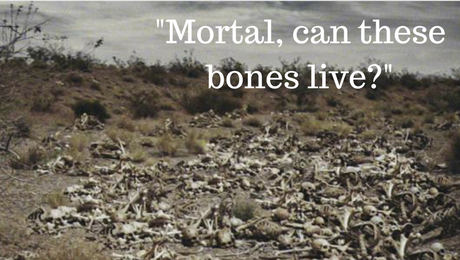 “Mortal, can these bones live again?” That’s what we are really asking. That’s what I want to know. Don’t you? That question is the valley that cuts through the center of our lives. And yet, it’s not a simple yes or no kind of question. Neither is it answered once and for all. It’s a question we live with and ask over and over. What is the valley that cuts through center of your life? What questions did you ask when the Lazarus of your life died? What questions are you asking today? Every time life sets before me those kind of questions I am reminded, once again, that I live with more questions than answers, and the answers I do have no longer seem to carry the weight and authority they once did. Our lives are filled with unanswered questions. My experience is that the unanswered questions of life tend to leave us disappointed; disappointed in life itself, in ourselves, in another, or sometimes in God. Disappointment is wrapped up in and bound by our unmet expectations. That’s where Mary and Martha are in today’s gospel (John 11:1-45). They are disappointed. “Lord, if you have been here, my brother would not have died,” they both say separately to Jesus. Even the crowd that follows Mary is disappointed. “Could not he who opened the eyes of the blind man have kept this man from dying?” they ask. I know that disappointment and I’ll bet you do too. We want answers, explanations, and understanding. But maybe there aren’t any; at least, not the kind most of us want. Maybe life itself is an unanswered question and maybe that’s how we are to live it. Jesus does not offer answers or explanations to Mary and Maratha, or to us. Instead, he uses our disappointment as “an agency for transformation” (David Whyte, Consolations, p.63). Jesus seems to know that disappointment is inescapable, necessary, and even a faithful response to life’s circumstances. He neither criticizes nor ridicules Martha and Mary for their disappointment. Instead, he uses it as an opening and entry point into their lives. There’s something honest, heartfelt, and real about Mary and Martha’s words of disappointment to Jesus. They are offering and making themselves available to him. They rethink what they know about life, death, and resurrection. They risk smelling the stench of death. They are walking in that valley that cuts through the center of their lives. To attempt to insulate ourselves from disappointment and demand once and for all kind of answers to life’s questions is to close ourselves to the vulnerabilities that make possible real life, love, intimacy, and relationships with God or with another. It limits what we are willing to risk giving or receiving. It leaves the stone in place over Lazarus’ tomb, and refuses to consider God’s question to Ezekiel. While we might want to escape our disappointments, life wants to use them. Life will not waste our disappointments, and Jesus always stands in the middle of life. Disappointment calls into question our assumptions about life, ourselves, each other, and God. Disappointment asks us to reassess ourselves and our inner world. It is the first step in freeing us from misguided assumptions. It breaks old patterns of seeing and relating that have become hardened and less than life sustaining. It opens our eyes to a deeper way of seeing. Jesus uses our disappointment in the unanswered questions of life to invite us to a “larger foundational reality” than what we create for ourselves and project onto the world (Whyte, p. 63). The great question before us (and Mary and Martha) is whether we experience our disappointment as an opportunity for seeing and engaging our lives and world in new, different, and life-giving ways “or whether we experience it only as a wound that makes us retreat from further participation” (Whyte, p. 64-65). It’s a question we answer every day. It’s a question Jesus answered throughout his life. Don’t think that Jesus did not know disappointment. He surely did. He knew disappointment in the death of Lazarus, the crucifixion, Peter’s drawn sword and violence, Judas’ betrayal, the disciples sleeping in the garden, the way his Father’s house had been turned into a den of robbers, his disciples arguing about who was the greatest, the disciples’ misunderstanding of who he is, the world’s refusal to receive him, and in a myriad of other ways. Every disappointment held before him, as it does for us, the choice between engaging or retreating from the world and our lives. He refused to be stopped by his disappointments. Instead, he used them as entry points into our lives. They became points of identification with us. His every disappointment become one more step deeper into the valley that cuts through the center of our lives. So let me ask you again. What is the valley that cuts through the center of your life? Whatever it is it’s a place through which Jesus has walked and shown the way forward. It is not the dark place we often think it is. It’s an aperture into the light, a path that opens to new life, a clearer way of seeing, a truer sense of ourselves, and a deeper experience of Christ. It becomes the place of our unbinding and being let go. In this valley “the question mark of life becomes God’s exclamation point” (D.S. ): the exclamation point of love, the exclamation point of life and light, the exclamation point of mercy and forgiveness, the exclamation point of wisdom, beauty, and generosity, the exclamation point of hope, healing, and compassion, and ultimately, the exclamation point of God’s “yes” to you and your life. “Mortal, can these bones live again?” The answer to that question echoes throughout the valley that cuts through the center of your life. Yes they can! Yes they do! Yes they will! *Portions of this sermon were inspired and guided by David Whyte’s writing on disappointment in his book Consolations (Langley, WA: Many Rivers Press, 2016), 63-65. This is an excellent article on how life is full of sadness, suffering & death. We run from these times in our lives. It is our nature to want good health, freedom of pain and the inescapable death to come, for us & our loved ones. But the Divine has suffered and overcome. We too have to believe that our health will improve, pain will one day leave us, and death will lead us to new life. As we journey towards Holy Week, may we give more love to others, overcome suffering with hope, and believe we will live on. Blessings to all who keep this season with devotion & faith. Thank you for your good words. May this Holy Week bring you to Easter light and life. Sarada, thank you for your wisdom and insight. I think our faith is often shaped in the crucible of doubt. Our questions are more a sign of faith than a lack of faith, a willingness to wrestle with God, to take seriously God’s presence in this world and our lives. I’ve always struggled with disappointments…me disappointing others and others me. Thanks for your thoughts. They provide much to consider. Marcia, I hope this sermon offers a different way of seeing and meeting disappointment, and that, by God’s grace, in some way it unbinds you and let’s you go. These questions are what facilitate growth. Allowing Him to show us a different perspective so that we DON’T retreat – or if he we do, He helps us heal and move forward. I’ve often found throughout my life that I might think one thing, then ask for some insight or help and then…. EPIPHANY! A whole new perspective. Sometimes I don’t even ask, but I still receive insight. Or I worry, and He tells me, essentially, there’s nothing to worry about, asking sometimes why I think there’s something wrong, simply because it looks that way. Realizing that the similarity of the situation was perpetuated regardless of the specifics was a lesson in and of itself. Now that it’s April, and your segment of FDBD is finished, I’m thankful there is access to your sermons. They are as thought provoking as your daily FDBDs were. Thanks for your comment. There are so many different perspectives, layers, and seeing within the scriptures and life. Each one I think adds fullness and the beauty, though that sometimes means standing in the place of paradox and contradiction. I appreciate you reading my blog. I continued to post sermons while also posting my FDBD meditations. If you scroll down the homepage you will find the sermons interspersed with the meditations. Previous Previous post: Who Has Nourished Your Life?